Class 5 Combo [2009-2010], Tube Combo Guitar Amp from Marshall in the Class 5 series. Product replaced by the Marshall Class 5 Combo [2011-2012]. Marshall Amplification is exhibiting the Class5, a combo guitar amplifier that offers all-valve (tube) tone in a simple format. Featuring a traditional top-loaded format reminiscent of Marshall's legendary "Bluesbreaker" style, the Class5 provides access to a panel, offering Bass, Middle, and Treble tone controls, and a single Volume knob. Set low, the Class5 delivers a sweet, clean sound - ideal for more lyrical moments. Positioning the volume knob at its midpoint offers the familiar Marshall valve-amp crunch; dialing up further provides an organic crunch for soloing and heavier rhythm playing. 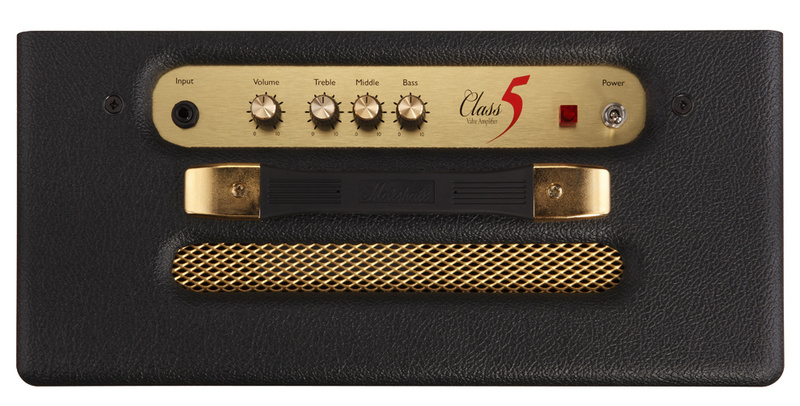 The Class5 features a 2 x ECC83 double triode preamp stage; a single EL84 pentode provides five Watts of power. It is now available with a U.S. MSRP of $560.00. Marshall Amplification is exhibiting at Booth 6440 (Hall A) at the 2010 Winter NAMM Show in Anaheim, CA. 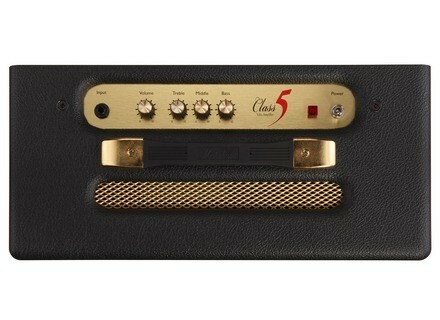 For more information on this model, visit www.marshallamps.com. [NAMM] Marshall LE Dave Mustaine Megastack Marshall Amplification introduced the new Dave Mustaine special edition MG microstack guitar amplifier, dubbed the "Megastack." [NAMM] Fabio Ragghianti Radical Classical Italian luthier Fabio Ragghianti has announced a new U.S. company, Ragghianti Guitars, based in Boulder, Colorado to distribute his new line of hand-crafted instruments. [NAMM] IK Multimedia StealthBoard IK Multimedia introduced StealthBoard, described as "the first USB-MIDI floor controller for guitar and bass players that gives you full control over your entire rig."